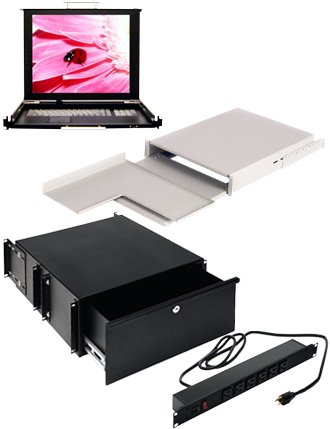 SWDP's complete line of accessories provide all the options you have come to expect to enhance your data room cabinets, racks and enclosures. From shelving products, to power management through a complete line of cooling options to provide you with everything you need. Our products have been time tested and insure they provide a complete functioning solution that will provide years of use. A complete line of power products including Zero U PDU's, rack mounted PDU's and high power PDU's. Cooling units that include thermostat controlled products, redundant cooling and whisper quiet products for low NC level sound requirements. An impressive shelf line that includes articulating keyboard units, HD fixed and pull out shelves, adjustable shelves and storage drawers. Keyboard drawers that have optional KVM switches, built-in LCD monitors and touch pads. Various ratings to meet all your needs/outlet ratings and input voltages. 19" & 23" shelf units with pull out and fixed applications. High output and low noise models available that can be added to existing cabinets as heat loads rise. Expandable, low RU models can be equipped to included "chainable" KVM switches.